Ocean Village Resort is a beautifully landscaped, 1,228 unit Condo Resort. 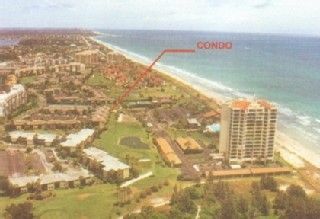 This Condo is on the first floor facing the Ocean (you can watch the sun rise in the morning, and hear the ocean at night), and 10 yards in front of it is the 1st tee of a 9 hole Golf Course ($4 greens fee in season, free off season). A putting green and six tennis courts are 30 yds. to the left of the Condo. It's about 75 yards from the Ocean, with a beautiful beach, and 50 yards from the main pool, which is Olympic sized, with a Jacuzzi there, a Kiddie pool, Tiki Bar, two Bocce Ball courts. four shuffle board courts, and a mini basketball court. The Clubhouse, at the Olympic sized pool, has it's own restaurant with a beautiful bar and dancing. The lower level (next to the main pool) has a Work Out room, Sauna, and shower facilities. There are also two other heated pools in the complex, another Bocce Ball court, two Shuffle Board courts, and four more lighted tennis courts by the entrance to OV II. Amenities:: The condo has wireless internet service. The Condo is fully furnished and equipped- washer, dryer, refrigerator with ice maker, dishwasher, microwave, coffee maker, dishes, utensils, etc. The week of June 10th, 2013, we re-painted the whole condo, bought a new leather 2nd sofa, new patio furniture, new hard enamel pots & pans, and installed new towel racks in the bathroom, a light on the fan in the bedroom, a lamp on the dresser, a small table and lamp by the sofa for reading, and installed a new magnifying mirror in the dressing/sink area. Also, all bedding and towels were upgraded. There is central A/C, ceiling fans in the living room, bedroom, and porch, a 42" color TV with satellite and DVD in the living room and a 32" TV with DVD in the bedroom. The bedroom has a Queen bed, and there is a queen size pull out sofa bed in the living room. There is a furnished, screened porch so you can watch the sun rise, and enjoy the ocean breeze and the sound of it at night. Also, there are three sets of golf clubs for your enjoyment on the 9 hole golf course, and three tennis racquets. Activities:: Fishing-You can rent and go out on a fishing boat from the Fort Pierce City Marina, or just drop a line at the Fort Pierce jetty, two miles north. Baseball-The spring training camp of the NY Mets (St. Lucie) are about a 1/2 hour away. UDT Navy Seal Museum-about 20 min. away on North Hutchinson Island. Manatee Observation Area-10 min. away in downtown Fort Pierce-great place to see live manatees (best viewing in winter)-no charge. Disney World/Universal Studios-approximately 2 hours away. Kennedy Space Center-approximately 1 hour 45 min. north. Ft. Pierce City Marina-downtown Ft. Pierce, on the Indian River-two mid priced restaurants (one right on the river), Marina, shops, special events. Diving-11 dive sites(15 to 60 Ft., some with old ship wrecks) all within an hours drive. Shopping:: The Treasure Coast Mall -US1 in Jensen Beach. The Prime Outlet Mall- two exits north at I-95 & Route 60 at Vero Beach. It's beautiful and has some great bargains. (It's where I usually shop). Alice & I got married April of (2013). We live in Cedar Key, which is on the West coast, about 4 1/2 hours NW of the condo, She owns the Cedar Key Bed & Breakfast, and I own the Gulf Kart Co. (rentals). Even though we live in Florida, in Cedar Key, we love going over to the condo at Ocean Village. It's like 'getting away' from our daily work lives, which is how it'll feel to you. I choose this condo in 2000 because it is close to everything. The ocean, pool, Jacuzzi, work out room, 1st tee, tennis courts, putting green, bocce ball, shuffle board, Tiki bar, restaurant, and people. Besides buying food, you can park your car and not use it again for days. That makes it relaxing. There is a separate dressing area outside the bathroom with vanity, sink, and a wall mounted magnifying mirror. 1st tee is 10 yards in front of the porch. 9 holes-$4 in season, $0 in the summer. The 9 hole golf course winds between condo buildings thru-out the village. Very pretty and interesting-a different view of the condo's. Everything is provided-all kitchen pots, pans, utensils, linens, etc. Just bring your beach clothes and toothbrush. The location of this condo is perfect. Close to the pool, ocean, right by tee box #1 on the golf course, and close to the putting green. It does sleep 5 but is a bit crowded. We love staying at Ocean Village. Thank you George for renting us your condo. This one bedroom had a lot of closet storage and extra room. For vacation this year, we literally pulled out a map of Florida and chose the Fort Pierce/Hutchinson Island area. Our search of rental properties led us to Mr. Oakley's unit at Ocean Village and I couldn't have been more pleased. We had everything we needed to make this a comfortable and enjoyable week. The unit was extremely clean. The kitchen had everything we needed for cooking several meals, the bed was very comfortable and I loved having a separate vanity area outside of the bathroom since there was myself, my husband and two younger sons. The beach is literally a 3 to 4 minute walk and on several occasions, we almost had the beach to ourselves. We felt like we were on our own private island! The community is very quiet and secure. There is a security guard at the front entrance 24 hours a day. Thank you for letting us spend our vacation in your unit. We hope to be back again! As always our stay was wonderful. It is so nice having everything you need not worrying you forgot something. Very well maintained, comfy bed and lots of closet space. Having the beach and pool a few steps is the best perk. If you are a golfer you step out your back door and you are ready to tee off. I'm not a golfer but I do play tennis which is only a few steps away also. This cono has the best location of all of Ocean Village. Thanks George for letting us rent it. We will be back next year. Ocean Village is on S. Hutchinson Island, a barrier island at Ft. Pierce, Fl. It is located 20 miles South of Vero Beach, and 50 miles North of W. Palm Beach. Departure Housekeeping fee---$85.00 Reservation Deposit---10% of the rental Important: Ocean Village Resort does not allow trailers or RVs in the Resort. Also, dogs/animals need to be run by the owner.